This is the wiki for polymath projects - massively collaborative online mathematical projects. The idea of such projects originated in Tim Gowers' blog post Is massively collaborative mathematics possible? Many polymath projects will be proposed, planned, and run at This Blog. A Polymath logo is being trialled. If you have more suggestions, please add them to the logo page, or add to the discussion at Talk:logo. The wiki is currently locked down due to a major influx of spam (July 29, 2013). Please email mn@michaelnielsen.org if you'd like an account set up, and I'll do my best to reply quickly. Polymath1: New proofs and bounds for the density Hales-Jewett theorem. Initiated Feb 1, 2009; research results have now been published. Polymath2: Must an “explicitly defined” Banach space contain [math]c_0[/math] or [math]l_p[/math]? Initiated Feb 17, 2009; attempts to relaunch via wiki, June 9 2010. Mini-polymath1: Solving Problem 6 of the 2009 International Mathematical Olympiad. Initiated July 20, 2009; five proofs obtained so far. Polymath3. The polynomial Hirsch conjecture. Proposed July 17, 2009; launched, September 30, 2010. Polymath4: A deterministic way to find primes. Proposed July 27, 2009; launched Aug 9, 2009. Research results have now been published. Polymath5: The Erdős discrepancy problem. Proposed Jan 10, 2010; launched Jan 19, 2010. Activity ceased by the end of 2012, but results from the project were used to solve the problem in 2015. Mini-polymath2: Solving Problem 5 the 2010 International Mathematical Olympiad. Proposed Jun 12, 2010; launched and solved, Jul 8 2010. Polymath6: Improving the bounds for Roth's theorem. Proposed Feb 5, 2011. Mini-polymath3: Solving a problem from the 2011 International Mathematical Olympiad. Proposed Jun 9, 2011; launched and solved, Jul 19, 2011. Mini-polymath4: Solving a problem from the 2012 International Mathematical Olympiad. Proposed, Jun 3, 2012; launched, July 12 2012. Polymath7: Establishing the Hot Spots conjecture for acute-angled triangles. Proposed, May 31st, 2012; launched, Jun 8, 2012. Polymath8: Improving the bounds for small gaps between primes. Proposed, June 4, 2013; launched, June 4, 2013. Research results have now been published. Polymath9: exploring Borel determinacy-based methods for giving complexity bounds. Proposed, Oct 24, 2013; launched, Nov 3, 2013. Polymath10: improving the bounds for the Erdos-Rado sunflower lemma. Launched, Nov 2, 2015. Polymath11: proving Frankl's union-closed conjecture. Proposed Jan 21, 2016; launched Jan 29, 2016. Concluded, Jan 17, 2017. Polymath12: proving Rota's conjecture. Proposed Feb 28, 2017. Polymath13: Intransitive dice. Proposed Apr 28, 2017. Polymath14: Classifying homogeneous norms on groups. Initiated Dec 16, 2017. Results submitted, Jan 11, 2018. Polymath15: Upper bounding the de Bruin-Newman constant. Proposed, Jan 24 2018; launched Jan 27 2018. Polymath16: Simplifying the lower bound proof for the Hadwiger-Nelson problem. Proposed, Apr 10, 2018; launched, Apr 14, 2018. Scott Aaronson's "philomath project": "Sensitivity vs. Block sensitivity" (see also this Math Overflow question). Launched Jul 13, 2010. A wiki page clearinghouse for the Deolalikar P vs NP paper. Launched Aug 10, 2010. Math Research Trends Wiki "research in the middle" This project is recommended to be discontinued in favor of Research in the middle project at Virtual scientific conference. The page for the ABC conjecture contains links and information about Mochizuki's claimed proof of this conjecture. The cap set problem. Proposed March 25, 2009 (see also these two followup posts). Boshernitzan’s problem. Proposed July 27, 2009. Possible future polymath projects. Discussion opened September 16, 2009. A possible polymath project: Proposal by Richard Lipton to attack a conjecture due to Erdos, about a class of Diophantine equations. A (partial) list of proposed projects can be found here. If you have a tentative proposal for a polymath project, you can either make a post on it on your own blog, or place it here. Is massively collaborative mathematics possible? Tim Gowers, January 27, 2009. A people's history of mathematics Luca Trevisan, February 1, 2009. The polymath project Michael Nielsen, February 3, 2009. Yet another math 2.0 proposal Lieven le Bruyn, February 11, 2009. Polymath1 and open collaborative mathematics Tim Gowers, March 10, 2009. Polymath Edmund Harriss, March 14, 2009. Massive open collaboration in mathematics declared a success Slashdot, March 18, 2009. How changing the technology of collaboration can change the nature of collaboration Michael Nielsen, March 18, 2009. The polymath project: scope of participation Michael Nielsen, March 20, 2009. Can polymath be scaled up? Tim Gowers, March 24, 2009. Concluding notes on the polymath project - and a challenge Vilpulniak, March 24, 2009. On scaling up the polymath project Michael Nielsen, March 25, 2009. A gentle introduction to the polymath project Jason Dyer, March 25, 2009. IMO 2009 Q6 as mini-polymath project: impressions, reflections, analysis Terence Tao, July 22, 2009. Selecting the next polymath project Terence Tao, July 27, 2009. Polymath equals user innovation Jon Udell, July 31, 2009. Massively Collaborative Mathematics, Jordan Ellenberg, The Ninth Annual Year in Ideas, New York Times, 2009. `But this is blog maths and we're free to make up conventions as we go along': Polymath1 and the Modalities of `Massively Collaborative Mathematics.' Michael Barany, Proceedings of the 6th International Symposium on Wikis and Open Collaboration, Gdansk, Poland, 2010. J. Cranshaw and A. Kittur. 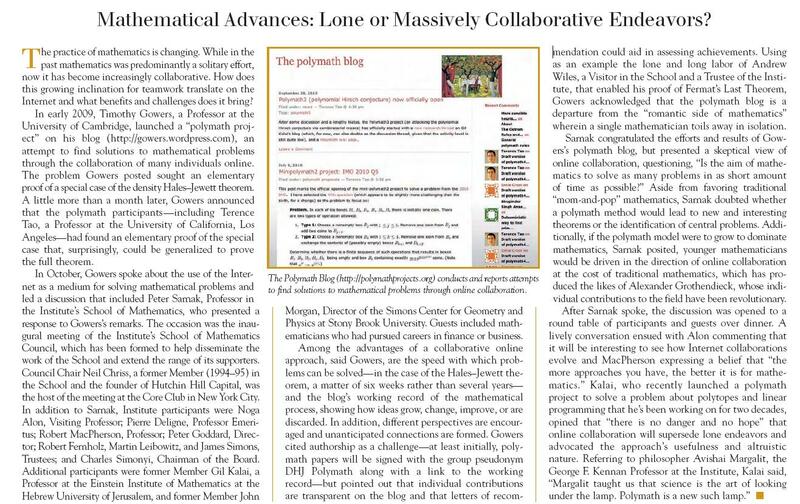 The Polymath Project: Lessons from a successful online collaboration in mathematics. In Proceedings of the Conference on Human Factors in Computing Systems, Vancouver, BC, Canada, May 2011. How to build the global mathematics brain, Jacob Aron, New Scientist, 4 May 2011. Mathematics becomes more sociable, New Scientist, 5 May 2011. Mathematical Advances: Lone or Massively Collaborative Endeavors? from IAS Institute Letter for fall 2010 based on a discussion organized by IAS fall 2010. Will ‘Crowdsourcing’ Revolutionize Scholarship? An article in UConn Today by Jeremy Teitelbaum, Fall 2010. The New Einsteins Will Be Scientists Who Share The Wall street journal, October 2011. Parallel lines, editorial, Nature 506, 407–408 (27 February 2014). Additional links are very welcome. To help combat spam, anonymous editing has been disabled, and a captcha system added to hinder automated account creation. If this is causing problems, please email mn@michaelnielsen.org.